What injuries and conditions is the McDavid 436 Achilles Tendon strap suitable for? Mild to moderate achilles tendon injuries such as achilles tendinitis / tondinosis. What sports is the achilles tendon strap suitable for? All sports, particularly those involving a high level of running and jumping where the achilles tendon is under a lot of strain. 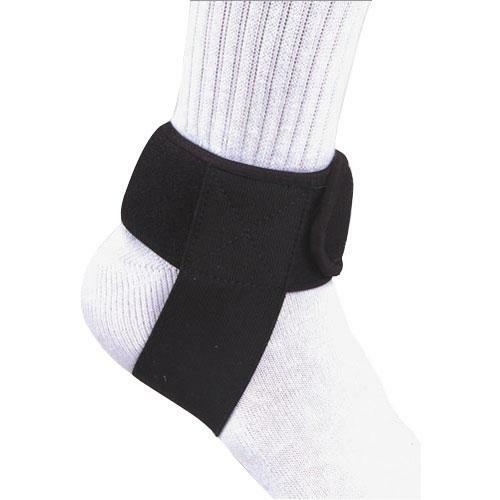 The McDavid achilles tendon strap works in a similar way to a tennis elbow strap. The tendon is under constant tension and pressure during running and jumping. It is subjected to sudden jarring forces. The strap applies constant pressure to the achilles tendon via a tubular buttress reducing these sudden jarring forces. In effect absorbing some of the energy like you would when placing your finger on a guitar string. The adjustable two way stretch neoprene wrap and hook and loop closures provide optimum fit and comfort. We aim to hold this product in stock and dispatch the same day if the order is placed before 1pm – later if we can. If you are in a hurry please give us a call. Special next working day delivery is available. If you would like to order this product please contact us by going to the contact us page and filling in your details we will advise on availability as this product is always in short supply due to its popularity.